This 10 minute dessert serves 8 people. This was the first time I made this recipe and yum I am impressed. I wasn't too sure about the success of it but the end result looks as good as it tastes. It took me 10 minutes to prepare and only cost $0.55 cents per person. I ate this cake as a snack for afternoon tea but you could also serve it up for dessert with some of your favourite custard or cream. 2. Grease a cake tin preferably a flan cake tin as you do not want to tip this cake upside down when removing it from the cake tin. 3. Mix flour, egg, milk, butter, mixed spice and sugar in a bowl with a wooden spoon until just combined. 4. Peel the apple and pear and thinly slice. 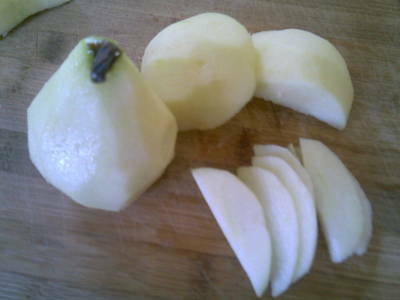 Thinly slice the pear and apple. 5. Pour ¾ of the cake mixture into the flan cake tin. 6. 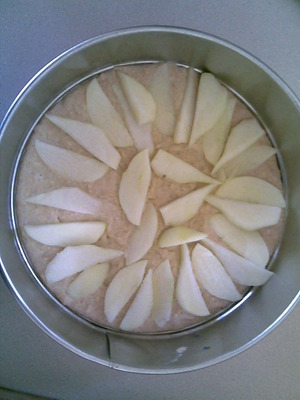 Spread the slices of apple and pear evenly over the cake mixture. 7. 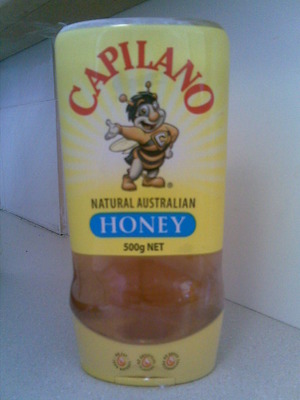 Pour or drizzle 1 tablespoon of Capilano honey over the mixture. Drizzle the Capilano honey over the apple and pear slices. 8. Spread the rest of the cake mixture evenly over the apple and pears with a spoon. 9. Sprinkle the rolled oats over the top of the cake mixture. 10. 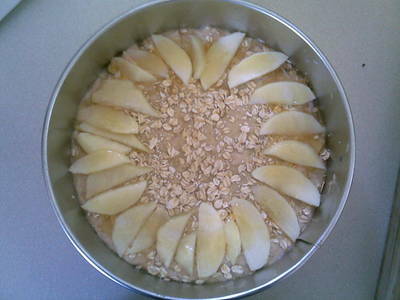 Arrange a layer of apple and pear in a circle on the outside of the cake. Spread the top layer of apple and pear slices evenly in a circle. 11. Pour or drizzle 1 tablespoon of honey over the apple and pear slices. 12. Sprinkle the crushed nuts (optional) in the middle of the cake. 12. Place in the oven for 30-35 minutes. 13. Serve warm or cold on it's own or with custard or cream. 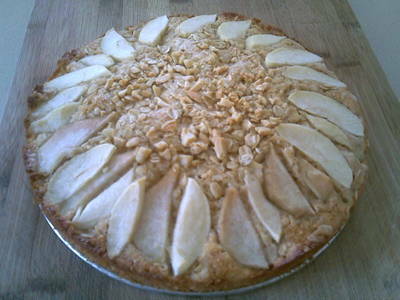 Apple and Pear Crumble Cake fresh from the oven. oh YUM!!!! Thank you for sharing this! 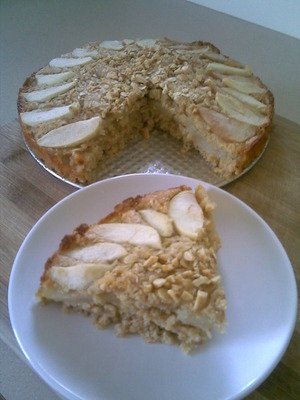 If I had apples and pears in the house, I would make this right now! I also love that you have cinnamon in this recipe; cinnamon helps fight fat! I love this recipe yum !!!! wil make this cake again and again !